A new person-directed philosophy is an exciting game-changer. For a long time, senior care facilities were not in the inspiration business. They focused on health care and safety, providing a place for seniors when living at home was no longer an option. But rejuvenating their clientele, creating inspirational and fun activities that would ignite a joy for life? Not so much. That is changing, and leading that charge in New Jersey is Collingswood Manor. Collingswood Manor is part of United Methodist Homes, a series of 10 communities serving senior men and women for more than 100 years. 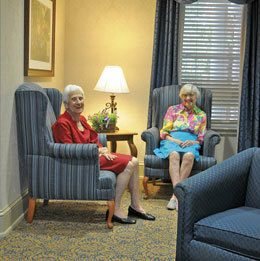 Services at the senior care community include residential and assisted living, respite and hospice care. Also available is skilled nursing, housekeeping, medication assistance, health monitoring, activity reminders, personal care and more. The Manor has amenities, too, including a bistro, dining room, rotunda, living room, library, chapel, gift shop, sunroom, porches and butterfly garden. Collingswood Manor also has a brand new spirit. Soon, the buildings will be more home-like and the staff and residents will work together to change the way everyone interacts and experiences their lives there. “This is about transforming how we live and operate in the business. We’ll have a system where people have more of a voice. It’s a person-directed philosophy,” says Len Weiser, executive director of Collingswood Manor. The physical changes include making individual living rooms and dining rooms, changing hallways or wards into “households,” and creating “neighborhoods,” with three households in each. Organizationally, there will be hierarchal changes. People working day to day—the team—will be self-directed and make the decisions. The business “leaders” will become consultants, helping to navigate processes so that decisions made can be realized. Although adhering to some companywide policies, the team will handle things such as schedules and conflict-resolution on their own, allowing the homes to function independently and differently from each other. Shifts already underway include “Tea and Chat,” a program where residents meet monthly with chefs to suggest food changes, and the resident committee working with the activity department on different options for residents. These changes began long ago, when stakeholders and residents began to find the original model was no longer working. “We were caught up in a cycle of being efficient health care providers, but this is not a factory,” says Weiser. “A variety of different philosophies were discussed and we knew we needed to make more person-directed choices,” he says. Much of these changes have been spearheaded by Action Pact, a change agent organization that has been in long-term care for more than 15 years. “They have experienced this need to change and have been part of it. They work in all the communities to find the best tools,” says Weiser. Collingswood Manor has signed to work with them for two years. Collingswood Manor is located at 460 Haddon Ave., Collingswood. For more information, call (856) 841-4331 or visit UMH-NJ.org. Published (and copyrighted) in Suburban Family Magazine, Volume 3, Issue 8 (October, 2012).